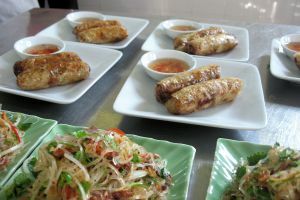 is a specialty of Hanoi, in the North. These rolls have a more complex filling and are rolled thicker than those we found in the south. The accompanying dipping sauce is also more salty-sour than its sweet southern counterpart. Season the pork with sugar, salt and yolks. In a food processor, or by hand, finely chop the garlic, scallions, cilantro and mint. Add to the pork. Soften the vermicelli by soaking in water too warm to the touch until pliable, about 10 minutes. Drain well. Finely chop the vermicelli and the bean sprouts and blend into the pork. In a wide bowl place an inch of warm water. Swirl one rice paper in the water just until moist (10 seconds), drain and set on a work board. Repeat with a second sheet and set it beside the first. One can be softening while you are rolling the other one. In about a minute the first paper will be pliable enough to fold without breaking. Place ¼ cup pork filling along the bottom 1/3 of the paper, gently shaping it into a cylinder. Lift the bottom edge over the filling. Fold in the side edges over the filling. Form into a tight roll about 3 inches long and 1 inch wide. Set aside and continue rolling the rest. Do not stack or they will stick to each other. These can be rolled several hours ahead and kept covered at room temperature. Heat the frying oil in a heavy pan to 350 degrees. Test the temperature by placing the edge of a spring roll in it. If the oil foams on contact it is hot enough. If it sputters violently it is too hot so pull the pot off the burner for one minute to cool. Add the rolls and fry, turning occasionally, until golden brown (about 5 minutes). Drain on paper towels. Serve while warm with the Vietnamese dipping sauce which follows. Cook’s Note: In Vietnam they use fresh rice papers which are semi-dried and thinner than the dried rice papers we have here. In supermarkets there are various brands available. Look for the thinnest ones, translucent rather than the thicker opaque ones. They may be round, triangular or square. The shape doesn’t matter, they will all make a roll.